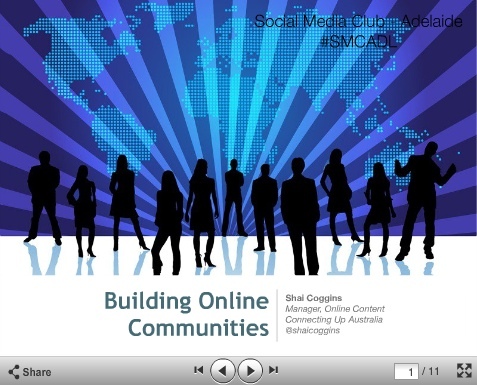 Some time in 2010, I was invited to be the first speaker at the inaugural Social Media Club Adelaide event. It was a special honour to be invited by my peers here, so I was both excited and terrified. However, I was pleased to have been able to share one of my great passions about online life with a fantastic audience of friends and colleagues. Talking about a great passion of mine: Community Building. In this talk, I focused on my 5 favourite ideas for building communities. To read all about it, visit: Favourite Ideas for Building Communities (at Vervely).